I’ve heard it said that everyone relates to WATCHMEN differently. The manager of my local comic shop dropped this doosey one day while we were talking about my first read of the book. I commented that the book didn’t really hook me until we got to Rorschach in chapter 6. That was the point when I became fully invested in the entire mythos. For him it was a different chapter. For others he knew, it was another scene entirely. The same has proven true with the movie. I have read several reviews from long time comic fans and none of them seem to see the movie in the same way. One says that the first 75 percent of the movie was dead on and the last bit was just plain wrong and disconnected. Another seems to say that it is the beginning that rolls in the stink. Yet another finds the adaptation leaves out too many nuances, but is pretty good overall. All of this banter seems to support, at least in my mind, the intimate and individual relationships that people develop with WATCHMEN. We each have our own take, our own special scenes that speak to us in delicate ways. My experience is different than all of them in that I have not dog-earned my copy of the graphic novel after decades of repeated readings; I have not had an illicit affair with the comics since the 1980s. I have not sat in the backrooms of comic shops and fought over the allegory of THE BLACK FREIGHTER or debated the adulation of Ozymandias with Alexander the Great. I have participated in a podcast after seeing the movie. 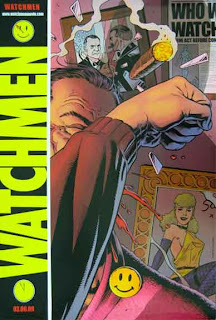 I come to WATCHMEN as a new comic lover and teacher. I find I am able to assimilate the comic and the movie more easily than some others, although even that is not entirely accurate, as I know a couple of comic veterans who were rather pleased. Go figure. Still, I see the movie as a shell of the deeper nuances and thick themes of the original source. It serves as a good companion to the book but can never take the place. Isn’t that always the case? Those of us who read (be they comics or traditional literature) always know that the movie should never stand alone. Did I like it? Yeah. I sure did, but I did so knowing that I have a copy of the book at home and I can go to bed tonight knowing that I can pick up that book anytime and relieve a truly remarkable story. Truth be told, I haven’t read it enough times yet, to really call myself a fan, but I plan to rectify that. I have developed a love and appreciation for a mythos that I will treasure for a lifetime and I am anxious to debate the merits of the book, the intricacies of the art, and the more hidden themes nestled deep inside. I know why the book is one of TIME Magazine’s 100 Best Novels. To watch the movie and skip the book – and I say this as someone who was at first turned off by the graphic novel – is to pimp your soul for a ride on the pop culture bandwagon. Don’t do it. And remember to make up your own mind when it comes to the movie, but please read the source material first. "To watch the movie and skip the book – and I say this as someone who was at first turned off by the graphic novel – is to pimp your soul for a ride on the pop culture bandwagon." I couldn't have said it better! That said, haha, I tried to ignore my love for the book going into the movie. And I may have tried too hard, 'cause I came out pretty disappointed. However, you make an excellent point about the varying experiences the story creates for different readers and, therefore, different viewers. You're also the second person I've read who's commented on the film as a companion to the text. If you're interested in another review, mine's at http://thedailypugle.blogspot.com/2009/03/who-watches-watchmen-daily-pugle-does_06.html.